The golf course, which opened in 2004, became part of a Czech golf history in 2009, when the Resort hosted the PGA European Tour for the first time, is a challenge for golfers of all skills. Thanks to the sensitive design of the golf course you get the feel that the course has always been there. Narrow fairways and well placed bunkers force the players towards a precise selection of golf clubs, and a clever negotiation of the Course. The holes flow uphill and downhill and you can be sure that every hole has its own character so you will not get bored. 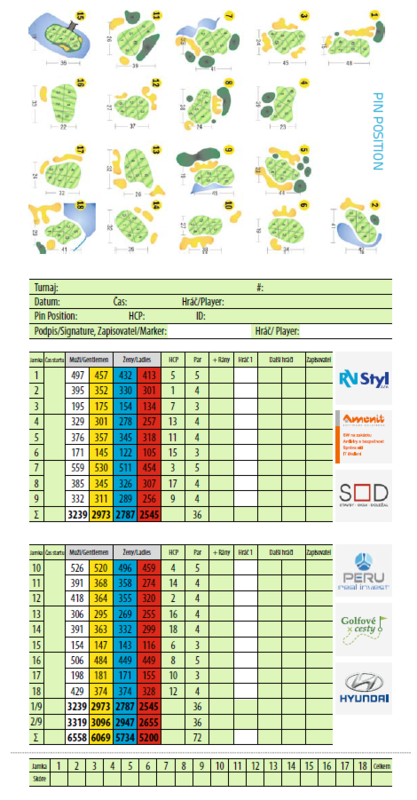 Multi level shaped greens, which are unique in the Czech Republic, gave hard time to many of the professionals during the PGA European Tour. Smartly placed water hazards range from little streams to a stunning island hole with a waterfall, which forces the players to really focus and think about the game. Each of the nine holes have a different character. Despite this fact the golf course gives a truly compact feel. It is no wonder that the Old Course hosted the PGA European Tour event also in 2010 and 2011. Out of bounds (Rule 27.1) - beyond any fence bordering the course or white stakes. White/black stakes indicate inner out for hole 14. Lime stones - on the holes 11 and 18 are part of the course. Overhead wires - on hole 14, another ball must be played, no penalty.